Unloading frozen coal and frozen pet coke from railcars economically and efficiently | Transloading Services, Inc.
Transloading Services, Inc. can economically and efficiently unload bulk commodities and construction materials (even frozen coal and pet coke), sand, stone, clinker, decorative stone, and frozen materials) from open top railcars directly into trucks for final delivery to destination. 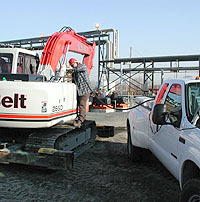 Every one of our highly trained operators has a machine support truck for onsite maintenance. Transloading Services, Inc. is able to unload frozen commodities during winter months or become an integral component of a rail-truck (intermodal) transportation package. This completely portable equipment can be transported by truck to almost any location without any restrictions or special permits required. TRANSLOADING SERVICES, INC. IS THE EXCLUSIVE NORTH AMERICAN LICENSEE OF PATENT #6,190,106. 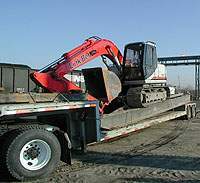 1) THE “PROCESS” OF PLACING ANY EXCAVATOR ON TOP OF AN OPEN TOP RAILCAR IN ORDER TO UNLOAD ANY MATERIALS. 2) THE USE AND DESIGN OF THE SUPPORT SYSTEM. 3) THE USE AND DESIGN OF THE RAMP. THERE ARE NUMEROUS OTHER ITEMS DETAILED IN THIS PATENT. PLEASE VISIT THE PATENT OFFICE’S WEBSITE AT: WWW.USPTO.GOV IN ORDER TO VIEW THE ENTIRE PATENT AND ALL THE CLAIMS THEREIN. PLEASE NOTE THAT WE WILL VIGOROUSLY ENFORCE OUR PATENT RIGHTS. ANY ATTEMPT TO PLACE AN EXCAVATOR ON TOP OF RAILCARS FOR UNLOADING PURPOSES IS A VIOLATION OF THIS PATENT.